The final battles of the European Theatre of World War II as well as the German surrender to the Allies took place in late April and early May 1945. Allied forces begin to take large numbers of Axis prisoners: The total number of prisoners taken on the Western Front in April 1945 by the Western Allies was 1,500,000. April also witnessed the capture of at least 120,000 German troops by the Western Allies in the last campaign of the war in Italy. In the three to four months up to the end of April, over 800,000 German soldiers surrendered on the Eastern Front. In early April, the first Allied-governed Rheinwiesenlagers were established in western Germany to hold hundreds of thousands of captured or surrendered Axis Forces personnel. Supreme Headquarters Allied Expeditionary Force (SHAEF) reclassified all prisoners as Disarmed Enemy Forces, not POWs (prisoners of war). The legal fiction circumvented provisions under the Geneva Convention of 1929 on the treatment of former combatants. By October, thousands had died in the camps from starvation, exposure and disease. The Dachau death train consisted of nearly forty railcars containing the bodies of between 2,000 and 3,000 prisoners who were evacuated from Buchenwald on 7 April 1945. Liberation of Nazi Concentration Camps and refugees: Allied forces began to discover the scale of the Holocaust. The advance into Germany uncovered numerous Nazi concentration camps and forced labor facilities. Up to 60,000 prisoners were at Bergen-Belsen when it was liberated on 15 April 1945, by the British 11th Armoured Division. Four days later troops from the American 42nd Infantry Division found Dachau. 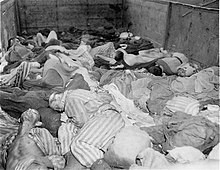 Allied troops forced the remaining SS guards to gather up the corpses and place them in mass graves. Due to the prisoners' poor physical condition, thousands continued to die after liberation. Captured SS guards were subsequently tried at Allied war crimes tribunals where many were sentenced to death. However, up to 10,000 Nazi war criminals eventually fled Europe using ratlines such as ODESSA. German forces leave Finland: On 25 April 1945, the last German troops withdrew from Finnish Lapland and made their way into occupied Norway. On 27 April 1945, the Raising the Flag on the Three-Country Cairn photograph was taken. Mussolini's death: On 25 April 1945, Italian partisans liberated Milan and Turin. On 27 April 1945, as Allied forces closed in on Milan, Italian dictator Benito Mussolini was captured by Italian partisans. It is disputed whether he was trying to flee from Italy to Switzerland (through the Splügen Pass), and was traveling with a German anti-aircraft battalion. On 28 April, Mussolini was executed in Giulino (a civil parish of Mezzegra); the other Fascists captured with him were taken to Dongo and executed there. The bodies were then taken to Milan and hung up on the Piazzale Loreto of the city. On 29 April, Rodolfo Graziani surrendered all Fascist Italian armed forces at Caserta. This included Army Group Liguria. Graziani was the Minister of Defence for Mussolini's Italian Social Republic. The front page of The Montreal Daily Star announcing the German surrender. Hitler's death: On 30 April, as the Battle of Nuremberg and the Battle of Hamburg ended with American and British occupation, in addition to the Battle of Berlin raging above him with the Soviets surrounding the city, along with his escape route cut off by the Americans, realizing that all was lost and not wishing to suffer Mussolini's fate, German dictator Adolf Hitler committed suicide in his Führerbunker along with Eva Braun, his long-term partner whom he had married less than 40 hours before their joint suicide. In his will, Hitler dismissed Reichsmarschall Hermann Göring, his second-in-command and Interior minister Heinrich Himmler after each of them separately tried to seize control of the crumbling Third Reich. Hitler appointed his successors as follows; Großadmiral Karl Dönitz as the new Reichspräsident ("President of Germany") and Joseph Goebbels as the new Reichskanzler (Chancellor of Germany). However, Goebbels committed suicide the following day, leaving Dönitz as the sole leader of Germany. German forces in Italy surrender: On 29 April, the day before Hitler died, Oberstleutnant Schweinitz and Sturmbannführer Wenner, plenipotentiaries for Generaloberst Heinrich von Vietinghoff and SS Obergruppenführer Karl Wolff, signed a surrender document at Caserta after prolonged unauthorised secret negotiations with the Western Allies, which were viewed with great suspicion by the Soviet Union as trying to reach a separate peace. In the document, the Germans agreed to a ceasefire and surrender of all the forces under the command of Vietinghoff at 2pm on 2 May. Accordingly, after some bitter wrangling between Wolff and Albert Kesselring in the early hours of 2 May, nearly 1,000,000 men in Italy and Austria surrendered unconditionally to British Field Marshal Sir Harold Alexander at 2pm on 2 May. German forces in Berlin surrender: The Battle of Berlin ended on 2 May. On that date, General der Artillerie Helmuth Weidling, the commander of the Berlin Defense Area, unconditionally surrendered the city to General Vasily Chuikov of the Soviet army. On the same day the officers commanding the two armies of Army Group Vistula north of Berlin, (General Kurt von Tippelskirch, commander of the German 21st Army and General Hasso von Manteuffel, commander of Third Panzer Army), surrendered to the Western Allies. 2 May is also believed to have been the day when Hitler's deputy Martin Bormann died, from the account of Artur Axmann who saw Bormann's corpse in Berlin near the Lehrter Bahnhof railway station after encountering a Soviet Red Army patrol. Lehrter Bahnhof is close to where the remains of Bormann, confirmed as his by a DNA test in 1998, were unearthed on 7 December 1972. German forces in North West Germany, Denmark, and the Netherlands surrender: On 4 May 1945, the British Field Marshal Bernard Montgomery took the unconditional military surrender at Lüneburg from Generaladmiral Hans-Georg von Friedeburg, and General Eberhard Kinzel, of all German forces "in Holland [sic], in northwest Germany including the Frisian Islands and Heligoland and all other islands, in Schleswig-Holstein, and in Denmark… includ[ing] all naval ships in these areas", at the Timeloberg on Lüneburg Heath; an area between the cities of Hamburg, Hanover and Bremen. The number of German land, sea and air forces involved in this surrender amounted to 1,000,000 men. On 5 May, Großadmiral Dönitz ordered all U-boats to cease offensive operations and return to their bases. At 16:00, General Johannes Blaskowitz, the German commander-in-chief in the Netherlands, surrendered to Canadian General Charles Foulkes in the Dutch town of Wageningen in the presence of Prince Bernhard (acting as commander-in-chief of the Dutch Interior Forces). German forces in Bavaria surrender: At 14:30 on 4 May 1945, General Hermann Foertsch surrendered all forces between the Bohemian mountains and the Upper Inn river to the American General Jacob L. Devers, commander of the American 6th Army Group. Central Europe: On 5 May 1945, the Czech resistance started the Prague uprising. The following day, the Soviets launched the Prague Offensive. In Dresden, Gauleiter Martin Mutschmann let it be known that a large-scale German offensive on the Eastern Front was about to be launched. Within two days, Mutschmann abandoned the city, but was captured by Soviet troops while trying to escape. Hermann Göring's surrender: On 6 May, Reichsmarshall and Hitler's second-in-command, Hermann Göring, surrendered to General Carl Spaatz, who was the commander of the operational United States Air Forces in Europe, along with his wife and daughter at the Germany-Austria border. He was by this time the most senior Nazi official still alive. German forces in Breslau surrender: At 18:00 on 6 May, General Hermann Niehoff, the commandant of Breslau, a 'fortress' city surrounded and besieged for months, surrendered to the Soviets. Jodl and Keitel surrender all German armed forces unconditionally: Thirty minutes after the fall of "Festung Breslau" (Fortress Breslau), General Alfred Jodl arrived in Reims and, following Dönitz's instructions, offered to surrender all forces fighting the Western Allies. This was exactly the same negotiating position that von Friedeburg had initially made to Montgomery, and like Montgomery the Supreme Allied Commander, General Dwight D. Eisenhower, threatened to break off all negotiations unless the Germans agreed to a complete unconditional surrender to all the Allies on all fronts. Eisenhower explicitly told Jodl that he would order western lines closed to German soldiers, thus forcing them to surrender to the Soviets. Jodl sent a signal to Dönitz, who was in Flensburg, informing him of Eisenhower's declaration. Shortly after midnight, Dönitz, accepting the inevitable, sent a signal to Jodl authorizing the complete and total surrender of all German forces. At 02:41 on the morning of 7 May, at SHAEF headquarters in Reims, France, the Chief-of-Staff of the German Armed Forces High Command, General Alfred Jodl, signed an unconditional surrender document for all German forces to the Allies, committing representatives of the German High Command to attend a definitive signing ceremony in Berlin. General Franz Böhme announced the unconditional surrender of German troops in Norway on 7 May. It included the phrase "All forces under German control to cease active operations at 2301 hours Central European Time on May 8, 1945." The next day, Field Marshal Wilhelm Keitel and other German OKW representatives travelled to Berlin, and shortly before midnight signed an amended and definitive document of unconditional surrender, explicitly surrendering to all the Allied forces in the presence of Marshal Georgi Zhukov and representatives of SHAEF. The signing ceremony took place in a former German Army Engineering School in the Berlin district of Karlshorst; it now houses the German-Russian Museum Berlin-Karlshorst. German forces on the Channel Islands surrender: At 10:00 on 8 May, the Channel Islanders were informed by the German authorities that the war was over. British Prime Minister Winston Churchill made a radio broadcast at 15:00 during which he announced: "Hostilities will end officially at one minute after midnight tonight, but in the interests of saving lives the 'Cease fire' began yesterday to be sounded all along the front, and our dear Channel Islands are also to be freed today." 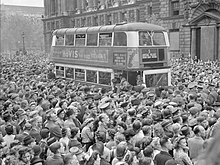 VE-Day: News of the imminent surrender broke in the West on 8 May, and celebrations erupted throughout Europe and parts of the British Empire. In the US, Americans awoke to the news and declared 8 May V-E Day. As the Soviet Union was to the east of Germany it was 9 May Moscow Time when the German military surrender became effective, which is why Russia and many other European countries east of Germany commemorate Victory Day on 9 May. The Second Army, under the command of General von Saucken, on the Heiligenbeil and Danzig beachheads, on the Hel Peninsula in the Vistula delta surrendered on 9 May, as did the forces on the Greek islands; and the garrisons of the last Atlantic pockets in France, in Saint-Nazaire, La Rochelle (after the Allied siege), and Lorient. On 13 May, the Red Army halted all offensives in Europe. Isolated pockets of resistance in Czechoslovakia were mopped up by this date. The garrison on Alderney, one of the Channel Islands occupied by the Germans, surrendered on 16 May, one week after the garrisons on Guernsey and Jersey had surrendered on 9 May and those on Sark on 10 May. A military engagement took place in Yugoslavia (today's Slovenia), on 14 and 15 May, known as the Battle of Poljana. The Georgian Uprising of Texel (5 April – 20 May) was fought between Georgian Nazi-collaborationist army units on Texel against the German occupiers of that Dutch island. Last battle in Europe, Battle of Odžak between Yugoslav partisans and NDH forces, concludes on 25 of May. The remaining NDH soldiers escape to the forest. A small group of German soldiers deployed on Svalbard in Operation Haudegen to establish and man a weather station there lost radio contact in May 1945; they surrendered to some Norwegian seal hunters on 4 September, two days after the Surrender of Japan. Dönitz government ordered dissolved by Eisenhower: Karl Dönitz continued to act as if he were the German head of state, but his Flensburg government (so-called because it was based at Flensburg in northern Germany and controlled only a small area around the town), was not recognized by the Allies. On 12 May an Allied liaison team arrived in Flensburg and took quarters aboard the passenger ship Patria. The liaison officers and the Supreme Allied Headquarters soon realized that they had no need to act through the Flensburg government and that its members should be arrested. On 23 May, acting on SHAEF's orders and with the approval of the Soviets, American Major General Rooks summoned Dönitz aboard the Patria and communicated to him that he and all the members of his Government were under arrest, and that their government was dissolved. The Allies had a problem, because they realized that although the German armed forces had surrendered unconditionally, SHAEF had failed to use the document created by the "European Advisory Commission" (EAC) and so there had been no formal surrender by the civilian German government. This was considered a very important issue, because just as the civilian, but not military, surrender in 1918 had been used by Hitler to create the "stab in the back" argument, the Allies did not want to give any future hostile German regime a legal argument to resurrect an old quarrel. Order JCS 1067 was signed into effect by President Harry S. Truman on 10 May 1945. This was part of the post-war economic plan that advocated how the Allied occupation would include measures to prevent Germany from waging further war by eliminating its armament industry, and the removal or destruction of other key industries required for military strength. This included the removal or destruction of all industrial plants and equipment in the Ruhr. In 1947, JCS 1067 was replaced by JCS 1779 that aimed at restoring a "stable and productive Germany"; this led to the introduction of the Marshall Plan. 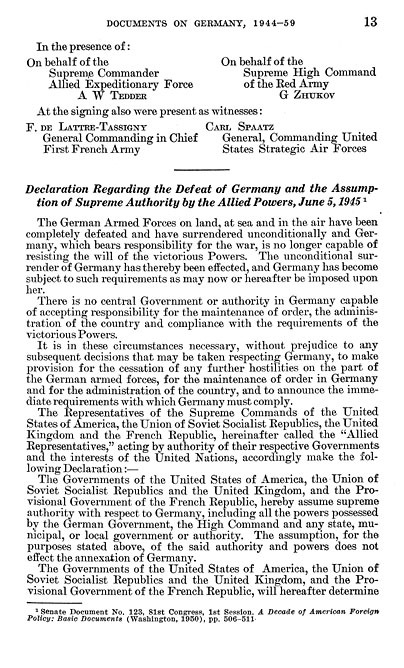 The Governments of the United States of America, the Union of Soviet Socialist Republics, the United Kingdom and the Provisional Government of the French Republic, hereby assume supreme authority with respect to Germany, including all the powers possessed by the German Government, the High Command and any state, municipal, or local government or authority. The assumption, for the purposes stated above, of the said authority and powers does not effect[a] the annexation of Germany. —  US Department of State, Treaties and Other International Acts Series, No. 1520. The Potsdam Agreement was signed on 12 August 1945. 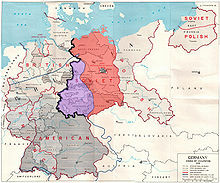 In connection with this, the leaders of the United States, Britain and the Soviet Union planned the new postwar German government, resettled war territory boundaries, de facto annexed a quarter of pre-war Germany situated east of the Oder-Neisse line, and mandated and organized the expulsion of the millions of Germans who remained in the annexed territories and elsewhere in the east. They also ordered German demilitarization, denazification, industrial disarmament and settlements of war reparations. But, as France (at American insistence) had not been invited to the Potsdam Conference, so the French representatives on the Allied Control Council subsequently refused to recognise any obligation to implement the Potsdam Agreement; with the consequence that much of the programme envisaged at Potsdam, for the establishment of a German government and state adequate for accepting a peace settlement, remained a dead letter. The Allied zones of occupation in post-war Germany, highlighting the Soviet zone (red), the inner German border (heavy black line) and the zone from which British and US troops withdrew in July 1945 (purple). The provincial boundaries are those of pre-Nazi Weimar Germany, before the present Länder were established. Allied Control Council created to effect the Allies assumed supreme authority over Germany, specifically to implement their assumed joint authority over Germany. On 30 August, the Control Council constituted itself and issued its first proclamation, which informed the German people of the Council's existence and asserted that the commands and directives issued by the Commanders-in-Chief in their respective zones were not affected by the establishment of the Council. Cessation of hostilities between the United States and Germany was proclaimed on 13 December 1946 by US President Truman. Paris Peace Conference ended on 10 February 1947 with the signing of peace treaties by the wartime Allies with the minor European Axis powers (Italy, Romania, Hungary and Bulgaria; although Italy by some was considered a major power) and Finland. The Federal Republic of Germany, that had been founded on 23 May 1949 (when its Basic Law was promulgated) had its first government formed on 20 September 1949 while the German Democratic Republic was formed on 7 October. End of state of war with Germany was declared by many former Western Allies in 1950. In the Petersberg Agreement of 22 November 1949, it was noted that the West German government wanted an end to the state of war, but the request could not be granted. The US state of war with Germany was being maintained for legal reasons, and though it was softened somewhat it was not suspended since "the US wants to retain a legal basis for keeping a US force in Western Germany". At a meeting for the Foreign Ministers of France, the UK, and the US in New York from 12 September – 19 December 1950, it was stated that among other measures to strengthen West Germany's position in the Cold War that the western allies would "end by legislation the state of war with Germany". In 1951, many former Western Allies did end their state of war with Germany: Australia (9 July), Canada, Italy, New Zealand, the Netherlands (26 July), South Africa, the United Kingdom (9 July), and the United States (19 October). The state of war between Germany and the Soviet Union was ended in early 1955. "The full authority of a sovereign state" was granted to the Federal Republic of Germany on 5 May 1955 under the terms of the Bonn–Paris conventions. The treaty ended the military occupation of West German territory, but the three occupying powers retained some special rights, e.g. vis-à-vis West Berlin. 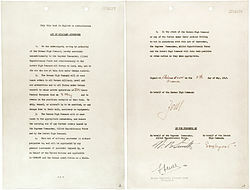 Treaty on the Final Settlement with Respect to Germany: Under the terms of this peace treaty, the Four Powers renounced all rights they formerly held in Germany, including Berlin. As a result, following the acts of official German reunification achieved on 3 October 1990 and which itself was enabled by the Treaty, Germany became fully sovereign on 15 March 1991. Under the terms of the Treaty, the Allies were allowed to keep troops in Berlin until the end of 1994 (articles 4 and 5). In accordance with the Treaty, occupying troops were withdrawn by that deadline. ^ Facsimile of the original text, the transcription used in the Avalon source for the paragraph is erroneous. In this case, "effect" is correct. The implication is that annexation of Germany did not occur with the assumption of all the powers of the German state by the four Allied powers. However the next paragraph explicitly stated that the "[four Allied powers] will hereafter determine the boundaries of Germany or any part thereof and the status of Germany or of any area at present being part of German territory". ^ Davidson, Eugene (1999). The Death and Life of Germany. University of Missouri Press. pp. 84–85. ISBN 0-8262-1249-2. ^ "The 11th Armoured Division (Great Britain)", United States Holocaust Memorial Museum. ^ "Station 11: Crematorium – Dachau Concentration Camp Memorial Site". Kz-gedenkstaette-dachau.de. Retrieved 20 September 2013. ^ Wiesel, Elie (2002). After the Darkness: Reflections on the Holocaust. New York, NY: Schocken Books. p. 41. ^ Knoch, Habbo (2010). Bergen-Belsen: Wehrmacht POW Camp 1940–1945, Concentration Camp 1943–1945, Displaced Persons Camp 1945–1950. Catalogue of the permanent exhibition. Wallstein. p. 103. ISBN 978-3-8353-0794-0. ^ Greene, Joshua (2003). Justice At Dachau: The Trials Of An American Prosecutor. New York: Broadway. p. 400. ISBN 0-7679-0879-1. ^ Wiesenthal, Simon (1989). "Chapter 6: Odessa". Justice not Vengeance. George Weidenfeld & Nicolson. ^ Kulju, Mika (2017). "Chpt. 4". Käsivarren sota – lasten ristiretki 1944–1945 [The war in the Arm – children's crusade 1944–1945] (e-book) (in Finnish). Gummerus. ISBN 978-951-24-0770-5. ^ Beevor 2002, p. 342. ^ Ernest F. Fisher Jr: United States Army in WWII, The Mediterranean - Cassino to the Alps. Page 524. ^ Ziemke 1969, p. 128. ^ Beevor, Antony (2002). Berlin: The Downfall 1945. Viking-Penguin Books. ^ Karacs, Imre (4 May 1998). "DNA test closes book on mystery of Martin Bormann". Independent. London. Retrieved 28 April 2010. ^ a b "The German Surrender Documents – WWII". Archived from the original on 17 May 2008. Retrieved 11 February 2005. ^ a b c Ziemke 1969, p. 130. ^ Ziemke 1990, p. 258 last paragraph. ^ Morgenthau, Henry (1944). "Suggested Post-Surrender Program for Germany [The original memorandum from 1944, signed by Morgenthau] (text and facsimile)". Box 31, Folder Germany: Jan.-Sept. 1944 (i297). Franklin D. Roosevelt Presidential Library and Museum (published 27 May 2004). Archived from the original on 31 May 2013. Demilitarization of Germany: It should be the aim of the Allied Forces to accomplish the complete demilitarization of Germany in the shortest possible period of time after surrender. This means completely disarming the German Army and people (including the removal or destruction of all war material), the total destruction of the whole German armament industry, and the removal or destruction of other key industries which are basic to military strength. ^ Beschloss, Michael R (2003). The Conquerors: Roosevelt, Truman and the Destruction of Hitler's Germany, 1941–1945. Simon & Schuster. pp. 169–170. ISBN 0743244540. ^ a b Plenipotentiaries 1945, p. 1 (3 PDF). ^ US Code—Title 50 Appendix—War and National Defense Archived 6 July 2008 at the Wayback Machine, U.S. Government Printing Office Archived 29 April 2009 at the Wayback Machine. Deutsche Welle special coverage of the end of World War II—features a global perspective.